Some call them Brag Tags or behavior beads, but I prefer “Target Tags”, because in my classroom, we talk a lot about setting goals and working towards our targets. 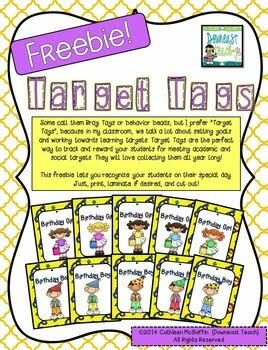 Target Tags are a wonderful way to track and reward your students’ progress. Take advantage of elementary students’ love of collecting by awarding Target Tags when they are demonstrating desired behavior, work habits, and academic skills. This fun freebie is a nice way to recognize your students on their special day. I use Target Tags for a variety of academic and social targets. My students are very motivated by them, and they are a low-cost and easy reward. Just print, cut, and hole punch! Laminating is nice, but not necessary.